Use our attorney-crafted Purchase Agreement form to create a legally binding contract between a seller and purchaser that documents the sale of an item. Legally declare your desire to purchase a good or service. The Basics: What is a Purchase Agreement? A Purchase Agreement is a legal document between two parties, the Seller who wishes to sell a piece of personal property and the Buyer who wants to buy that property. The Agreement describes the terms and conditions of the sale and ensures that both parties will follow through on their promises regarding that sale. A Bill of Sale or invoice can and should be used in conjunction with a Purchase Agreement. 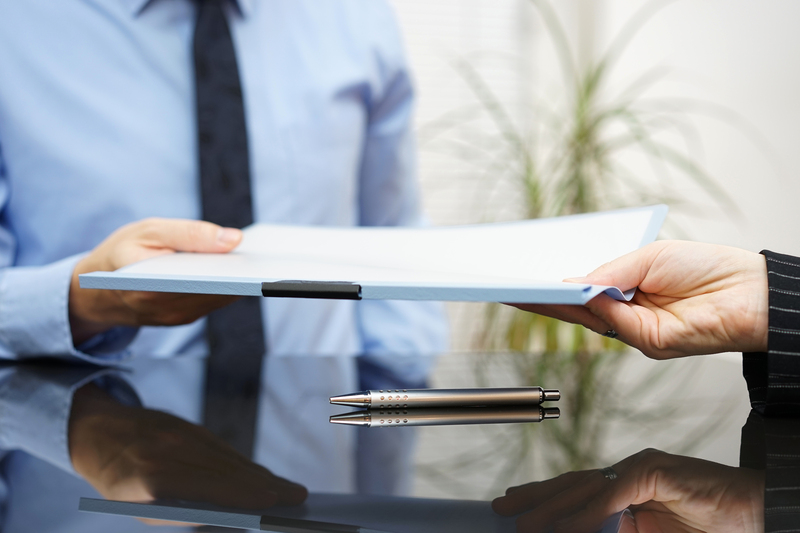 What is the difference between a Purchase Agreement and a Bill of Sale? 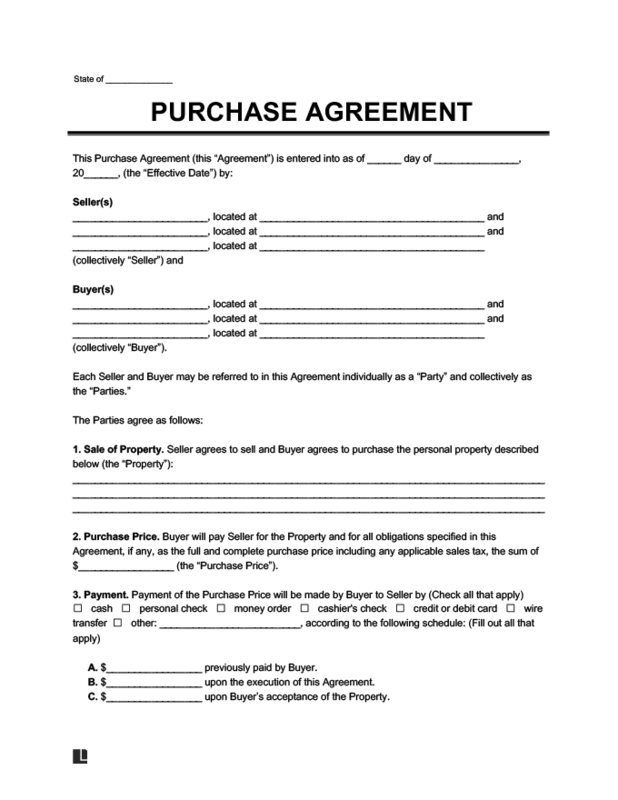 A Purchase Agreement is signed before any property or money is exchanged. It is an agreement between the parties to enter into a future transaction and documents the details of what that transaction will be. A Bill of Sale is signed during or after the exchange of money and property. It documents the transfer of ownership from the Seller to the Buyer, and acts like a receipt to the transaction. This document can cover a wide range of personal property being sold, from jewelry or an iPhone to a car or a Monet. The sample purchase agreement below details an agreement between the seller, ‘Michelle B Davis’, and the buyer, ‘Larry L Rose.’ Michelle B Davis agrees to sell a panda plushy to Larry L Rose according to the specified conditions. If you’re looking to sell or purchase a business, please use our Business Purchase Agreement. If you are either selling or purchasing any personal property, you should consider documenting your transaction in a Personal Property Sales Contract. A written Contract will allow both parties to carefully consider and describe the details regarding the sale, and confirms each party’s understanding of how the transaction will take place. It is also important to keep a record of the property that you sell for tax and accounting purposes. Selling property may have an impact on your tax return. The Internal Revenue Service (IRS) requires you to report all miscellaneous income, including income from the “barter and exchange of goods”. A tax lawyer or certified accountant can give you more information about how the sale of property may impact your tax return. Some states require that a sales and use tax be added to the purchase price of personal property being sold. Be sure to include who will be responsible for any such taxes in your Purchase and Sale Agreement. Once you’ve found someone to buy the used Stephen Curry mouthguard you found near the bench at the Golden State Warriors game or you’ve finally found someone selling the mint green vintage Ford Mustang you’ve been dreaming of, you will want to make sure that nothing goes wrong with the sale. If you don’t have a Purchase and Sale Agreement, the Buyer might mistakenly think he or she is getting a brand new mouth guard or the Seller might suddenly want more money for the car. Websites such as Craigslist, Ebay, Poshmark and other online marketplaces have made it easier to connect buyers and sellers of personal property.